This bionic hand may shake up the whole industry. Image courtesy of Exiii. The future is here my friends, and it looks like Handiii, a robotic arm that can be 3D printed and controlled by the electrical activity in your muscles. Handiii demoed at Maker Faire 2014. Image courtesy of Exiii. Handiii can perform simple tasks, like handshakes, pointing, or holding and releasing a ball. In a demo video with Ruptly TV, a representative says that the arm can be programmed with additional commands. The electronic arm works through a smartphone connection and a EMG sensor, a device that can read the signals your body sends when you intend to move a muscle. You may have seen or heard about EMG sensors that work with video games or health technology. Your smartphone then interprets these signals, causing the arm to perform different motions. 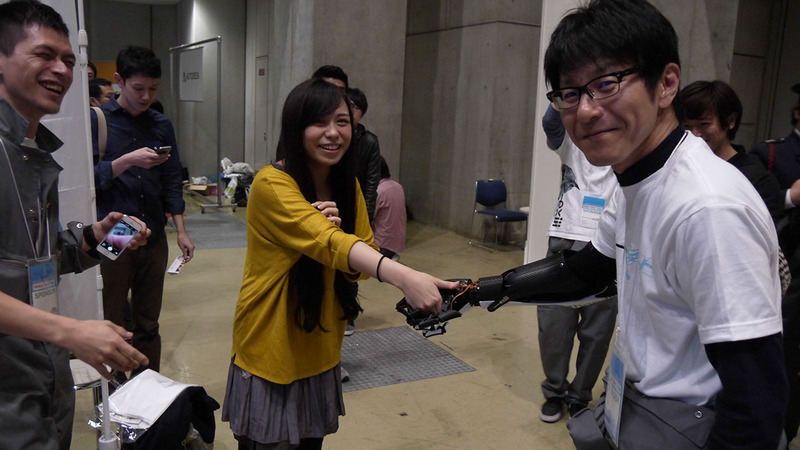 Exiii, the Japanese technology behind the arm, demoed it at this year’s SXSW. According to Exiii’s website, the creators wanted to design a reasonably priced, but still useful prosthetic limb. Most bionic arms with the amount of Handiii’s functionality cost $10,000 – $40,000, but Handiii was able to manufacture theirs for under $300. Handiii is customizable. Image courtesy of Exiii. Because Handiii is 3D printable, you can customize the colors, texture, and other aesthetic features of the bionic arm, and new parts can be reprinted as necessary. You also don’t need to be an amputee to use the device. Handiii can be remotely controlled; however, the practicality of that is questionable. The problem? Handiii isn’t available for sale yet. Exiii has yet to set a consumer price and is currently only selling their product to research institutions. BUT being able to even create a functional bionic arm for under $300 is a big step forward, and a sign that the prosthetic industry might be about to get a major overall.